There are many ways you can serve in this world, but one in particular caught my interest. This ministry is called Abandoned But Precious. They not only reach out to the abandoned and needy children of India, they are doing much more. They are giving these children hope for a future by allowing them to learn, giving them the word of God, giving them food and shelter as well as giving them back their childhood. Unfortunately, many children who don’t find their way into such orphanages as this one, will die, be put into prostitution and possibly slavery. Some of you may be asking “where are their parents?” That is a valid question. Most of them have died from diseases such as HIV or from other illnesses, are too poor to take care of themselves or their children, they are disabled and can’t even walk, etc. This is a tragedy and I am so thankful that my donation of $20.00 a month will help this wonderful cause and will provide all the needs of one special child who honestly needs it. From the website you will read that Abandoned But Precious Ministries was founded in 2005 after a mission trip to Southern India. After seeing the desperate plight of children in India, we felt called to extend the love of Christ to the children on India. We currently partner with an orphanage – Berachah Eklesiastical Mission and a children’s home – Bethany Children’s Home. These facilities provide 63 children with a loving, nurturing, safe, clean christian environment to grow up in. The majority of the children are from homes which cannot provide for them for various reasons. Many are single parents who have several children and can not feed and education them all, others are from families in which one parent is disabled and unable to work to provide the needed money for food and education. Some of the children are orphaned or abandoned. Of the 63 children, currently 50 of them have sponsorship. Sponsorship of $ 20.00 a month provides one child with food, clothing, shelter and an education. Without the opportunity for these children to reside in these facilities, most of them would be forced into child labor or possible prostitution and would have no opportunity for an education. You can read more about this amazing ministry by going to Abandoned But Precious. Monday night was a special night. Luke was able to feel our son move for the first time. Previously our son would stop moving every time Luke would put his hands on my belly, but not this time. Just to make sure Luke wasn’t mistaking our sons kicks for something else I would tell him right when I could feel the baby move and asked if he could feel him. That seemed to do the trick and Luke felt confident that he was in fact feeling his son inside me. I can only imagine what that must have felt like for him. A dad doesn’t have much to do with a baby being developed compared to the mother, so I think that them feeling the baby move, watching the ultrasounds and seeing pictures makes it more real and exciting and it gives them a sense that they are in fact part of this amazing story and that in time they will come face to face with a child that is undoubtedly theirs. A cute little girl recites Psalm 23 as only a little girl can. I’ve been experiencing a problem with WordPress lately. It seems that any post that starts with the letter ‘W’ in the post slug returns a blank page when in single view. I’ve try different themes, deactivated plugins and optimized my database but no change. And when I say blank, I mean blank. Looking at page source shows no text at all. If I change to post slug to read ‘problem’ instead of ‘what-problem’ everything is fine. Look at the archives to see how I fixed other “W” posts. Follow this topic on the WordPress forum. Update: I upgraded my WordPress install and the problem seems to have corrected itself. It’s a Craig’s list miracle! After many attempts to find a crib that would best suit our needs, we finally found one. The Pali Lucy crib is made in Italy and is known for its high quality. The Baby Bargains Book gave the Pali cribs an A- rating, which was another reason we were attracted to the crib. 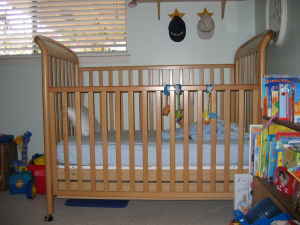 We also loved that the crib converts to toddler bed, has a one hand drop-side and has no exposed hardware. The mattress also has 3 levels, a drawer on the bottom for storage as well as a toddler / infant side high-end mattress. We are so excited! I told my husband that I wouldn’t feel as though our pregnancy was totally real until we had a crib…well now we do. Okay, I’m going out on a limb here by saying that there are two things most pregnant woman pray they never get. One is the dreaded stretch mark and second is varicose veins or better known as spider veins. Why? Because they are ugly, red and a permanent fixture on your body. In time, yes, stretch marks will fade, but they will never completely go away and varicose veins don’t dissapear unless you have surgery. I don’t think I’m being vain in saying this and I don’t consider myself as a high maintance kind of woman. Come on, no one likes noticeable flaws on their body. The reason that I went on this tangent is because yesterday I found my first stretch mark as well as a varicose vein on the back of my left leg. So much for wishful thinking and for belly butter! Pregnancy is definitely 9 months of constant surprises. Psalm 25 is one of many prayers David prayed to God. I am always amazed at how humble and honest he is when he prays to the Lord. He knows that all things come from God…his power, wealth, life, his ability to rule a kingdom… everything. His understanding gives him ultimate gratitude for all he has and always desires for more of God’s attributes such as love, wisdom, understanding, mercy, patience and instruction. He also never forgets to ask God for protection against his enemies because he knows that God can show mercy to whom he so desires as well as bring down those he so chooses. David’s trust and devotion to the Lord allowed him to become one of the greatest kings that ever lived. That is amazing! Mark W. Lewis wrote a wonderful little article called Top 10 Lies told to Naive Photographers, Artists and Designers where he covers the top ten ways to give away your work when you should be getting paid big bucks. I’ve only listed the lies but he has some great commentary to help put things into perspective. Now, as a new photographer just starting out, you may want to do a few freebie sessions with friends and family to get comfortable with the process. Shooting a friend’s wedding for free isn’t wrong. But then you’re doing them a favor. Eventually, you’re going to have to charge people just to keep from getting burned up. Even if you don’t feel you’re good enough. But when you go from amateur/hobbyist/enthusiast, to trying to make a living at photography, you better well be good enough to charge for your services. Finding bedding can be just as difficult as picking out a name, or at least it seems that way to me. Anyway, my husband and I were walking through Baby USA about a month ago and we found the most adorable bedding ever. I was so excited and even more so when my husband agreed with me. We added it to our baby registery at Babies R Us as soon as we registered. The colors are vibrant and fun and our son can use it through his toddler years. Yea! What a relief to have one less thing to think about.